There is a place in Southeast Oklahoma that conjures tales of medieval knights, wholesome princesses, and glorious adventures. It is a place rich with history, and is a place nearly forgotten in the echoes of time. 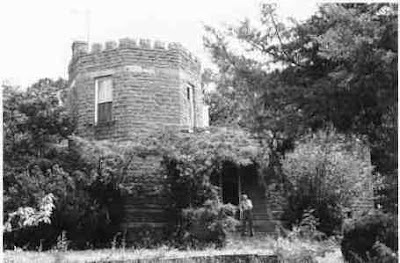 Situated on the Southwest slope of Cameron Mountain, near Poteau, Oklahoma, Captains Castle sits like a misplaced Arthurian legend. Also known as Reynolds Castle, the massive stone structure is truly a unique architectural wonder. The castle was built by Captain J. E. Reynolds for his wife Felicity in 1890. Constructed of native stone quarried from a nearby hillside, the Captains Castle was modeled after the medieval castles of ancient Europe. According to deeds left behind by Felicity, the castle originally sat on 240 acres. The walls are two feet thick, and both the inner and outer layers of rock are insulated with gravel and sand. Despite the cold stone walls, the castle remained comfortably warm. The Captain had installed several coal-burning fireplaces throughout the dwelling. From the stone turrets accentuating the roof-line to the two octagon-shaped towers, this citadel home could easily hold off a horde of ruthless barbarians.